Lots of holiday quilts to pick from below. 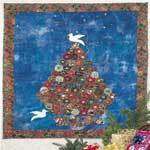 Sew a Christmas heirloom with a free quilt pattern. Even a pattern for a wall hanging Christmas quilt that would also be perfect for a new Christmas baby. 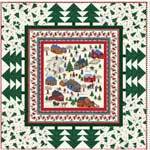 Create this adorable Christmas quilt with a little village covered in snow and the town's people celebrating the joy's of Christmas. This quilt will certainly be one of your families heirlooms. 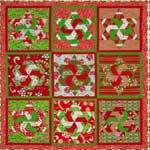 This quilt is bursting in Christmas colors of red, green and white! Each of the nine (9) blocks that make up this 64 x 70 inch quilt has a star made from strips of fabric that are laid out in different variations. 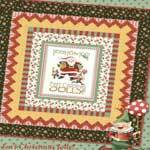 Here is a Christmas quilt of a jolly Santa and a couple of his elves, all bearing gifts. Easy corner triangles and strip piecing makes this a simple project for a quilt filled with the Christmas spirit. Nothing says Christmas like a Christmas tree adorned in beautiful ornaments. 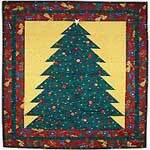 Create a quilt that has a large Christmas tree all decked out in colorful ornaments, plus a star on top using this Christmas quilt pattern. Here is a unique quilt with a yoyo Christmas tree. It has a blue background and a dove sits at the top of the tree. Very pretty. 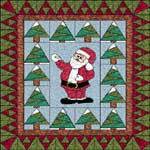 Jolly ole St. Nick is waving hello surrounded by evergreens on this bright and cheerful quilt. Make one to add to your home's Christmas decor.